Well hello there from the top of the hill. Over the coming weeks we have a number of fantastic events including Tom Cox reading ghost stories by candlelight and Robin Ince with a comedian’s take on what it is that makes us human – to say nothing of Paul Ewan and that man Plug. 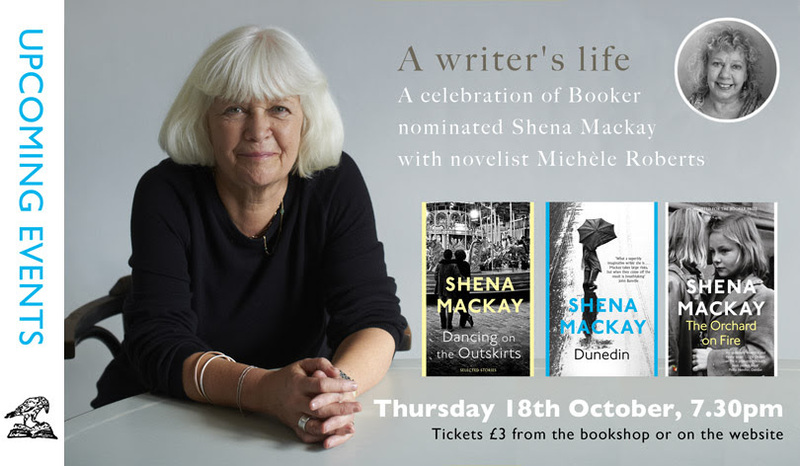 But firstly and very, very proudly, we present one of our favourite authors, Shena Mackay in conversation with Michèle Roberts. Shena Mackay is one of our finest writers and we are proud to be celebrating her work with fellow novelist Michèle Roberts. Shena was born in Edinburgh in 1944 and her career began when she won a prize for a poem at the age of fourteen. She experienced success early when, before the age of twenty, her first two novels DUST FALLS ON EUGENE SCHLUMBERGER and TODDLER ON THE RUN were published. Nominated for the Booker with the wonderful novel THE ORCHARD ON FIRE she has been up for numerous awards and is a fellow of the Royal Society of Literature. We are honoured to welcome her to chat about her work, her life, and (particularly) south London, with highly acclaimed author and friend, Michèle Roberts. Michèle has had twelve novels published and is Emeritus Professor of Creative Writing at the University of East Anglia. Her latest book is THE WALWORTH BEAUTY.